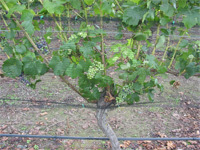 Depending on the size of vines, the trellis system being used, and the desired aesthetic, different net dimensions, weights, and systems will be required. To meet these varied needs, Neal Carter and Associates Ltd. Provides a range of different nets. Drapeover nets are the easiest to apply, take off, and provide the highest quality of coverage. 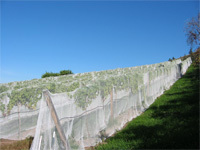 Most commonly used sizes in vineyards are 5mx400m and 6.5mx300m, though in some high-density vineyards a 10mx200m net can be draped over multiple rows simultaneously. Zonenet™ sidenets are the most cost efficient and unobtrusive form of bird protection. The applicator is expensive, but the nets themselves are almost 40% cheaper than the drapeover varieties. This is because side net only covers the growing region of the vines, which means it is fastened to the trellis. It is more time consuming to apply, but provides complete bird protection..
We also weave custom nets to any weight, dimension, or opening requested, and have designed and built net structures, so regardless of the layout of your farm, we can provide coverage. 20 X 100 30 15 Ask for quote! 20 X 100 40 15 Ask for quote! 20 X 100 50 15 Ask for quote! Other volume discounts are available, contact us for a quote!